Camp DSE-224 was located 9 1/2 miles northeast of the town of Lake Norden. Mary Lou Anderson of rural Lake Norden reported in 1986 that her husband, Wendell O. Anderson, remembers that the camp was located east of Dry Lake just north of S. D. Highway 28. Mrs. Anderson also provided a map showing the area where the men of the camp worked and camped. 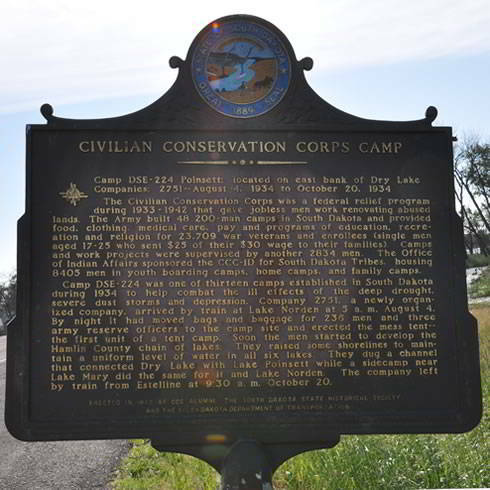 Company 2751 was at the camp from August 4 until October 19, 1934. It then moved to Camp F-16 (Oreville). At 5 0' clock on the morning of August 4, 1934, Company 2751 detrained at Lake Norden. In about 10 hours the bags, baggage, and 230 men had been transported to their new home--a barren field. In a short time a flourishing little tent city was set up (1935). Everything was strange to most concerned, but within a week the company commander was prepared to turn 200 men over to the forest service for work on the project. Mr. Alfred Mueller and his four foremen, consisting of T. A. Prendergast, T. Reedy, Alfred Leech, and Richard Maloney, took the men out on the project as soon as sufficient equipment arrived (1935). The project consisted of erosion work, digging of ditches so that the lakes might fill even with a minimum of precipitation, and the raising of shorelines of various lakes. The largest of these projects was the connecting of Lake Mary and Lake Norden. 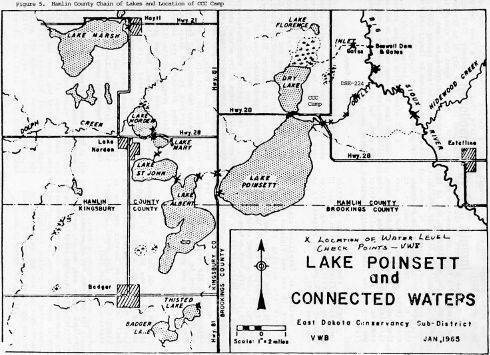 The same was done with Lake Poinsett and Dry Lake (1935). On the weekends, especially Sundays, the camp was a mecca for sightseers and tourists. People came from surrounding towns within a 100­mile radius to visit the camp. People from Lake Norden, Estelline, Hayti , Castlewood, Dempster, and Arlington seemed to vie with one another in trying to be hospitable to the company (1935). Soon a baseball team and a kittenball team were organized. The baseball team played town teams from Estelline, Lake Norden, Arlington, and Dempster. The kittenball team played several games with the nearby towns and enjoyed better than average success. Other sports developed in the course of the summer were horseshoes and boxing (1935). The first medical officer of the company, 1st Lt. William H. Newkirk, was transferred to Company 2749 at Canton on September 10. He traded places with Dr. Norman Schaefer, contract surgeon (1935). At various times the wind wrought havoc with the canvas shelters, and a heavy rain made conditions uncomfortable for the members of the command (1935). September 30 was the end of the first enrollment period, and 17 men decided not to reenroll. They left to attend school or take advantage of better positions. Several others had previously been discharged to accept employment or for various other reasons. On October 6 seven new recruits from the southeastern part of the state brought the company strength up to 204 (1935). On October 8 orders to transfer to the Black Hills for winter quarters were received. The new location was to be Camp F-16 (Oreville), Hill City (1935). About 2 weeks before the movement, three of the surrounding counties, to show their appreciation for the work that had been done and still to be done, circulated petitions asking that the company be allowed to build winter quarters at the Lake Poinsett location (1935). Instead the assistant district inspecting officer arrived on October 18 and the district inspecting officer arrived on October 19, preparatory to the move (1935). Loading at Estelline started on October 18 and was finished before 8 0' clock the morning of the 20th. Loading on the final day was done in a steady downpour. 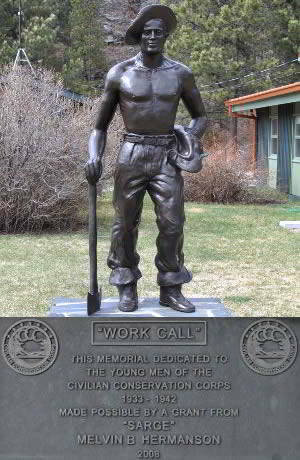 At 9:30 a.m. on October 20, the company entrained and started the trek back across the state to the Black Hills (1935). 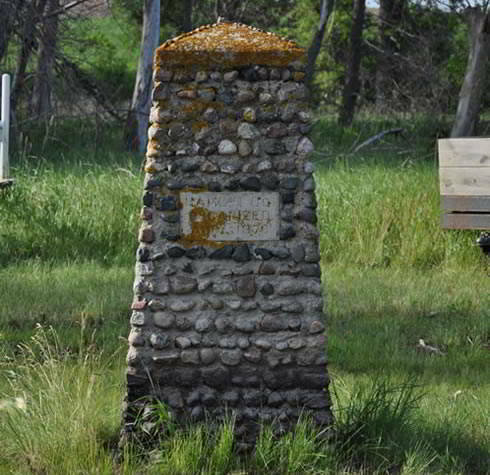 A marker designating that Hamlin County, South Dakota was organized in 1878 stands very close to the CCC marker for Poinsett - Lake Norden.